If you are new user, please contact your BEMA sales representative to setup a user account for you to log in. If you already have account but forgot the password, you can use the Forgot Password page to request password reset. 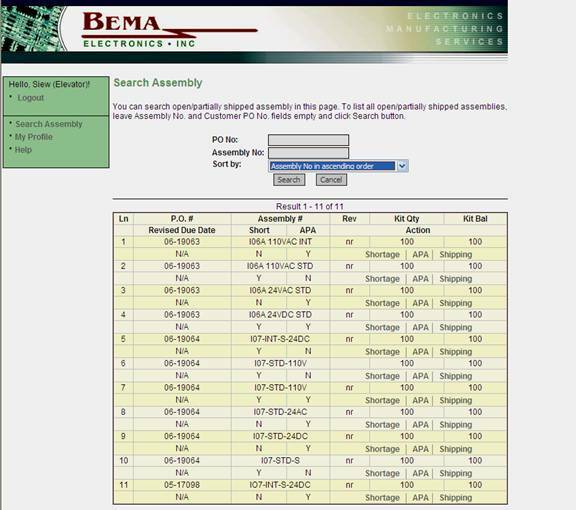 Or you can contact your BEMA sales representative directly. PO Number Search. For partial search, enter the sub-string and it searches for PO number containing the sub-string. For example: to search for PO number containing sub-string 123, enter "123" and click search. Assembly number search, same search logic as above. Search results can be sorted by different category. Note: If no search string is entered at all, then it will output all listing for the company. You can perform the following actions on the output listing. "Y" on column "Short" indicates existence of shortage. "Y" on column "APA" indicates existence of "Alternate Parts". 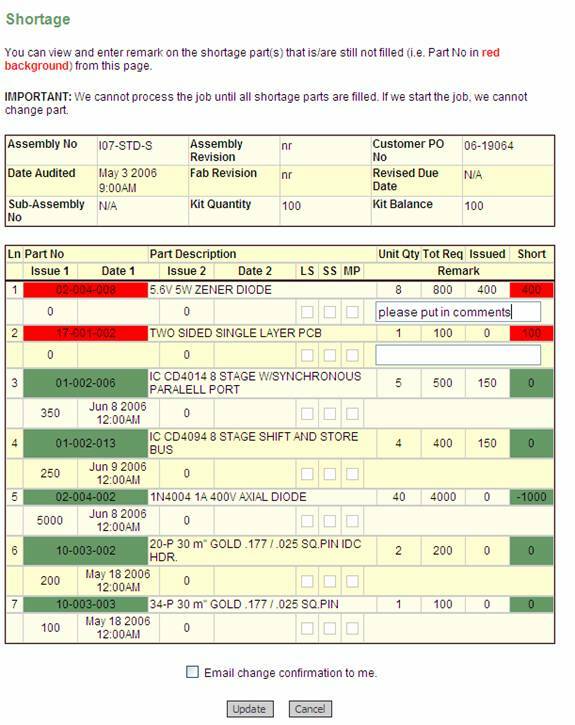 Click on "Shortage" to display parts shortage for that assembly. See part D - Shortage section. Click on "APA" to display alternate part for that assembly. See part E - APA section. Click on "Shipping" to display more shipping details. See part F - Shipping section. Shortage parts for the assembly are indicated in red. Please note comment in the remark area. Enter additional comments as necessary and press 'Update' to save changes. There is a check box "Email Change Confirmation to me". If checked, an email will be send showing changes made. Alternate parts for the assembly are indicated in red. There are three types of approval. "Hold" means no change, or do nothing. 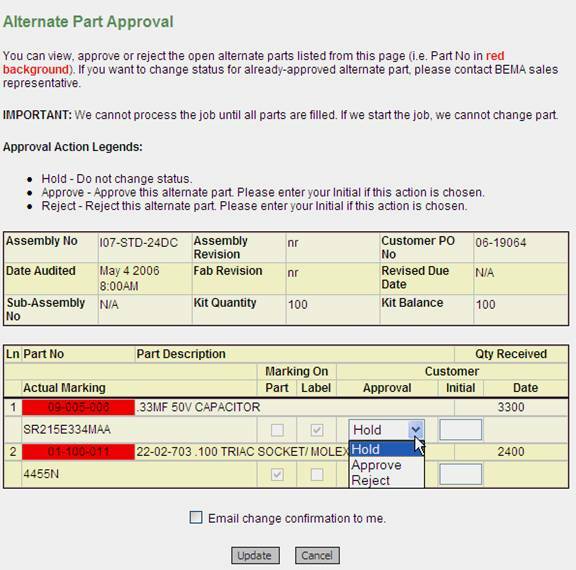 "Approve" to approve the alternate part. Please enter initial. Once approved is save/update, no future changes is possible. To make change after update, please call Bema directly. "Reject" to reject the alternate part. Please enter initial. Indicates shipping status of the assembly, such as shipped date, quantity, final due date and promised quantity. Note: Screen is only for informational purpose. No additional action is necessary. For any further questions, please feel free to contact Celso at BEMA Electronics for any questions.